The Keystone Information Commons is currently designed to look like this image. The Keystone Information Commons was scheduled to begin Phase I building this June. The project was postponed, however, due to East Stroudsburg Borough regulations regarding roadways and parking. “The borough has worked with us from the stand point that they have an ordinance, and they are expecting us to live up to that ordinance,” said Kenneth Long, Vice President of Administration and Finance at East Stroudsburg University. The university is required to have three different intersections renovated: Smith Street and East Brown Street, Normal Street and Prospect Street, and East Brown Street and Prospect Street. The intersection between Smith Street and East Brown Street requires the installation of a traffic signal, which is expected to cost between $100,000 and $150,000 according to Long. The university previously agreed to fund 65 percent of this project, and has recently agreed to pay 100 percent. 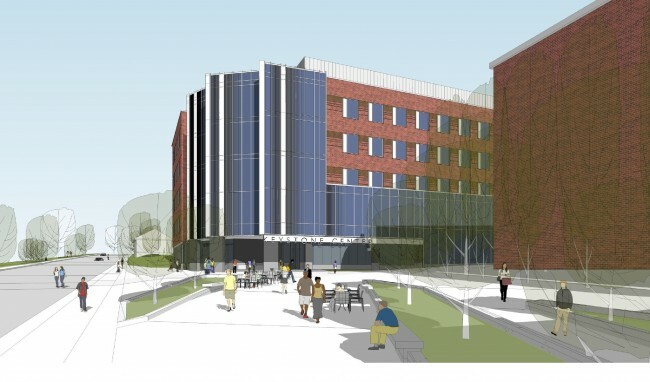 The cost of this renovation was previously anticipated during the construction of the suites and at least 65 percent of the costs have already been budgeted. A turning lane must be put in between Normal Street and Prospect Street. The university has given the borough authorization to use land they own to create the necessary turn lane. The project, however, has a value set that is not to be exceeded. This project is anticipated to cost between $100,000 and $200,000. The two intersections nearest to the University are being built by the East Stroudsburg Borough and funded by ESU. A turning lane must also be put in between East Brown and Prospect Street, but because it is so far removed from campus and not the property of the University, the owner of the road, PennDot, is responsible and will do the repairs. The university is required to have at least one more hearing with the borough to discuss parking. The university has provided its own formula to establish the amount of spaces needed to satisfy the parking ordinance. The university has undergone a 900-student drop in enrollment over the last 4 years. This continues to be a factor the university considers while making decisions regarding parking and construction. The rising cost of the project is the biggest concern for the Department of General Services, who is funding it. They have set aside $74 million in total. “The longer this project waits, the more expensive it becomes,” said Long. If the project ends up costing more in the long run, the University intends to cut corners in the building’s design to cover the cost.